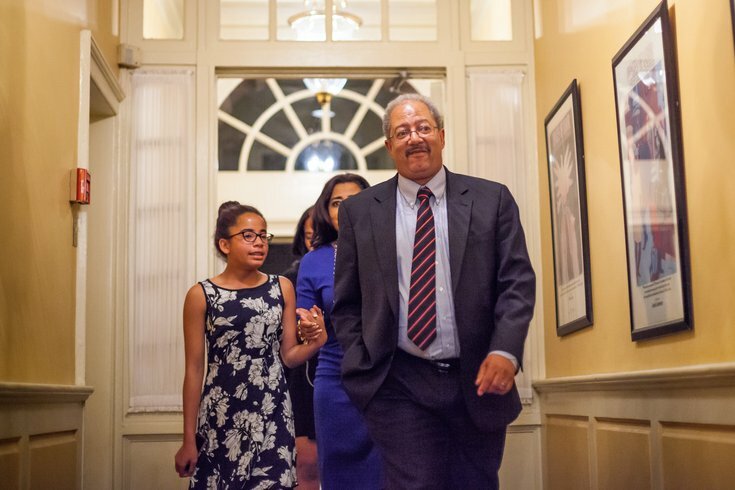 U.S. Rep. Chaka Fattah arrives with his family at the Local 1199C Hospital & Healthcare Workers Union where he gave his concession speech, Tuesday, April 26, 2016. The 11-term congressman lost to state Rep. Dwight Evans in the Democratic primary, and on Tuesday, June 21, 2016, a federal jury found him guilty of racketeering charges. WASHINGTON — Democratic Rep. Chaka Fattah of Pennsylvania will resign from the House immediately, according to a letter from his desk sent to Speaker Paul Ryan announcing his resignation. "Today, after 21 years of service, Congressman Chaka Fattah (D-PA) tendered his resignation from the U.S. House of Representatives," it begins. The decision follows Fattah's conviction on charges of racketeering, fraud and money laundering. On Wednesday, Fattah had offered his resignation effective Oct. 3. That apparently has changed. The news also follows a push from House Speaker Paul Ryan calling for him to resign immediately. In a statement late Wednesday, Ryan said the veteran Pennsylvania lawmaker had betrayed the trust of the House and his constituents. Ryan said he hoped Democratic leaders would join him in calling for Fattah's immediate resignation. The congressman was convicted Tuesday in a racketeering case that largely centered on efforts to repay an illegal $1 million campaign loan. His lawyers had argued that the schemes were engineered without Fattah's knowledge by two political consultants who pleaded guilty in the case. The 59-year-old Democrat had been in Congress since 1995. But he lost his April primary and his bid for another term.